Phil Minton comes from Torquay. He played trumpet and sang with the Mike Westbrook Band in the early 1960s, then in dance and rock bands in Europe for the later of part of the decade. After living in Sweden for some years, he returned to England in 1971, rejoining Westbrook and was involved in many of his projects until the mid 1980’s. For most of the last forty years, Minton has been working as a improvising singer in lots of groups, orchestras, and situations, throughout the world. Numerous composers have written music especially for his extended vocal techniques. He has a quartet with Veryan Weston, Roger Turner and John Butcher, and ongoing duos, trios and quartets with above and many other musicians. Since the eighties, His Feral Choir, where he voice-conducts workshops and concerts for anyone who wants to sing, has performed in over twenty countries. This is one of my very earliest wax cylinder recordings and was made live during a concert at the staatsbankberlin – the former DDR national bank in Berlin-Mitte that became a thriving new music, installation and theatre venue from 1999 until 2003. Phil Minton’s vocal improvisations were recorded onto two wax cylinders as part of a Recording Angels event entitled voices & etchings. 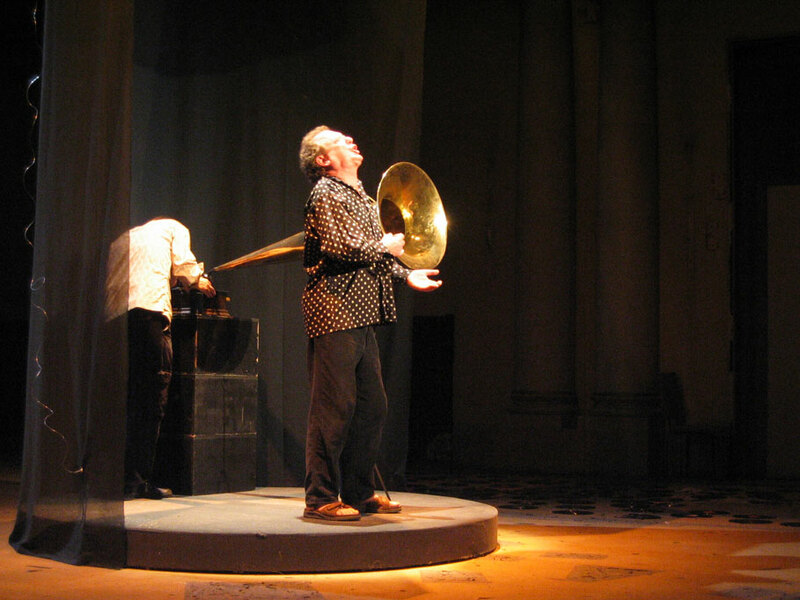 During the second half of the concert, he sang an improvised duet together with his vocal effigies on the wax cylinders, reproduced from a giant brass phonograph horn. The main hall where the live recording took place was vast and one can hear the reverberations recorded onto the cylinder which has become somewhat degraded due to numerous plays on the phonograph. Also heard very faintly during the first 15 seconds, is the voice of the soprano Anna Clementi who also appeared in the concert; her test recording was previously etched on the same cylinder, which I then wiped clean of its spiral groove with alcohol, although traces of the groove remained and were registered by the playback stylus.